The African swine fever is spreading via Western Europe from Russia and the Baltic area for some years already. The viral disease, originally coming from Africa, infects domestic pigs as well as wild boars. It is not harmful to humans, pets or other wild animals. Georgia reported the first reported cases of African swine fever in Europe in 2007. From there it spread into the adjoining countries of Armenia, Azerbaijan and the Russian Federation. Between 2012 and 2014, the disease had spread westward to the Ukraine, Belarus, Poland and the Baltic area. It affected domestic pigs as well as wild boars. In June 2017, the Czech Republic reported first cases of African swine fever. With this recent spreading of the African swine fever, the risk of its introduction to Central Europe has increased significantly. However, it is estimated that the risk of African swine fever introduction to the wild boar population is higher than the risk of an introduction to the domestic pig sector. Wild boars are responsible for the majority of the recent spreading of African swine fever. The disease spread within the wild boar population without any significant direct participation of domestic pigs. An analysis of the EFSA could not find any connection between the wild boar density and the number of African swine fever reports in domestic pigs. Even though all disease outbreaks in domestic pigs occured in areas with a suitable wild boar populations, no direct contact between the domestic pigs and the wild boards was found. Furthermore, there is also no correlation between the number of reported outbreaks in domestic pigs and the number of reported African swine fever cases of wild boars. The natural reservoir of the African swine fever-virus is the warthog. In the countries where the African swine fever originated it spread via the Argasidae (Lederzecke). In Europe, however, the virus spreads through direct contact with blood or other body fluids of infected animals. The feeding with food waste or pork products can also lead to an infection. The German Friedrich-Loeffler-Institute also counts transport vehicles and contaminated clothes, hunting equipment and farming implements as risky factors. Illegal import and disposal of contaminated material as well as vehicles and people along the highway network are also a high risk. Additionally, increasing risk factors for the disease’ spreading are the frequent use of insufficient bio safety measures by pig farmers. This includes the feeding of food waste or contaminated green fodder in neighbouring eastern countries. The disease is fatal for the infected animals after 2 to 10 days in more than 90% of all cases. There is no form of medication against the African swine pest yet. If there is a infected animal in a stable, the whole stock has to be killed. This fact, consequently, leads to a high concern of the German domestic pig sector. Joachim Rukwied, president of the German farmer’s association, warns that an outbreak of the African swine fever in Germany would have “disastrous consequences” for the pig farmers. He further states that, “all defensive measures against the disease have to be taken”. Furthermore, the German minister of agriculture Christian Schmidt, says that “a intelligent reduction of the wild boar population plays a essential role in the prevention of the disease”. Therefore the German farmer’s association now demands the killing of 70% of the German wild boar population to prevent the spreading of the African swine disease. At the moment, approximately 600.000 animals are killed by hunters in Germany. This number is supposed to rise by a couple of hundreds of thousands.Henning Voigt, deputy director of the hunting association of Mecklenburg-Western Pomerania, says: “the larger the wild boar population, the larger the risk of a possible disease outbreak”. The farmer’s association will present possible prevention measures. This will include, according to the “Rheinischer Post”, boarder controls with dogs that will strike to contaminated products. They also want to inform harvest workers in their own languages. Additionally, the farmer’s association will inform truck drivers, coming from the affected countries, to not throw away any food waste. Furthermore, the pig farmers have to take care of the cleaning and disinfection of the transporters. Some federal states already facilitated the hunting of wild boars and even decided on bounties. A study of the German Friedrich-Loeffler-Institute (Federal Research Institute for Animal Health) rates the risk of an entry of African swine fever into Germany through illegal transportation and disposal of contaminated material as high. The same applies for the risk of entry of contaminated pork meat and from pork derived products by vehicles or people along the main traffic routes. However, in contradiction to the German Farmer association, the study rates the risk of a direct spread through infected wild boar as moderate. Furthermore, the Friedrich-Loeffler-Institute published a study according to which the “reduction of the wild boar population through intensified hunting” is of little avail till now. The studies sees anthropogenic causes as the reason for he spreading over large distances.. The most important prevention measure is an import ban. Such a measure also includes the safe disposal of contaminated food waste. Observing population monitorings with immediate report of anomalies in the forest and sensitisation of gamekeepers and hunters are also essential. An analysis of African swine fever-reports by the EFSA in 2015 showed that passive monitoring was more effective than active monitoring. This applies for the recognition of disease outbreaks in domestic pigs and for locating cases in wild boars. The set out bounties for wild boar in some federal states of Germany leads to a significant increase of wild boar meat. The oversupply of wild boar meat leads to a problematic and still unsolved situation in its marketing and disposal. Local sellers also have to compete with cheap imports. Therefore, they decided to drop the prices. Hunters in the region now just get 50 cents for a kilo of wild boar meat. As it is known, wild boar is one of the main food sources of the wolf. 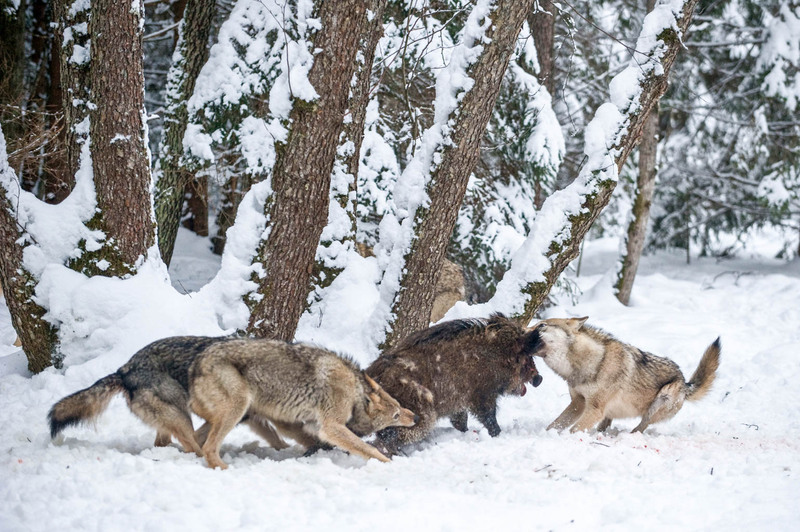 Therefore, the return of the wolf to Central Europe plays a significant role in the management of wild boar populations. Furthermore, wolves prefer sick animals as this makes their hunting substantially easier and less risky. As the virus is not harmful to other wild animals, wolves can play a essential role in the diseases management! This example perfectly shows the effects of such interconnected relations and impacts of the return of Europe’s wild life, in particular the large carnivores! It is proven that the return of the wolf has far reaching effects on ecosystems. The management of wild boar or deer populations is just one example of them.